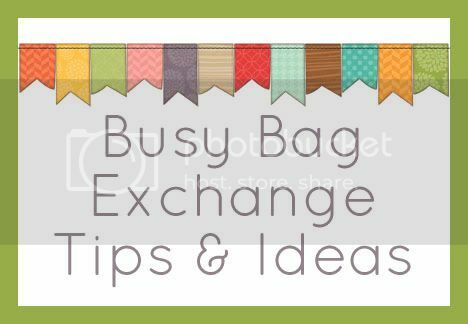 I'm sharing some experiences and ideas from the recent busy bag exchange I posted. You can read part 1 here and part 2 here. You can see the rest of the ideas I gathered for the swap on this google doc. 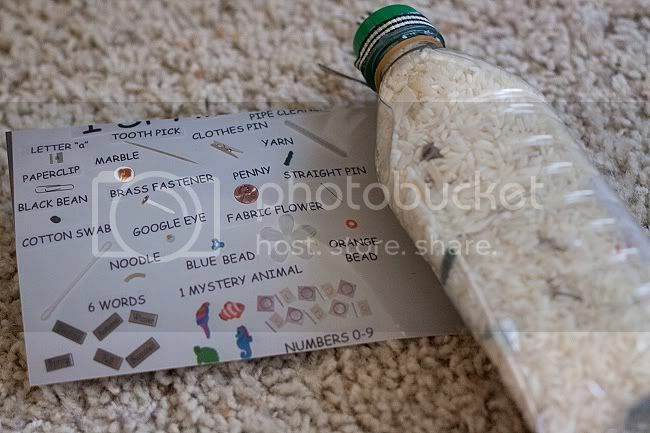 Today I'm sharing the preschool aged busy bags from the exchange. 1. Numbers Flip Book. This was my bag and I decided to go with something new that I could also share with you here! 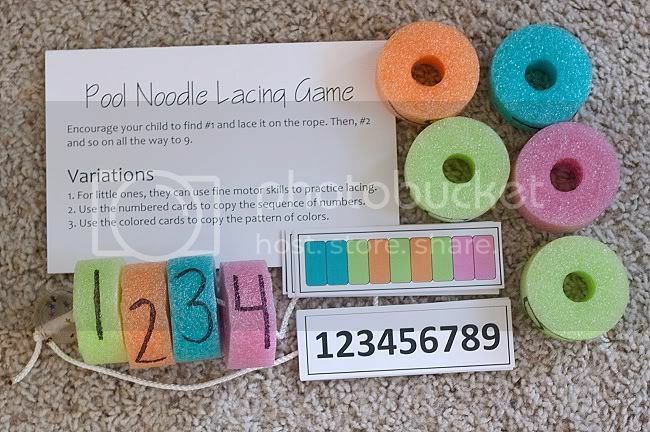 I was inspired by the flip book here to make a preschool appropriate one using numbers and number words. I choose to focus on zero through nine for number sense reasons and to avoid going into double digits. On the left side cards are numerical numbers. 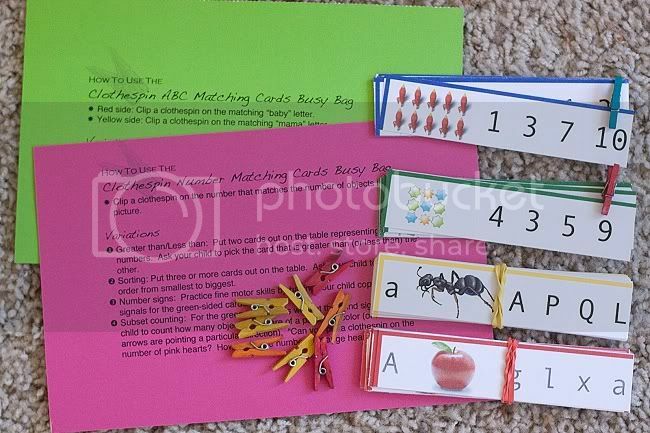 The child turns the cards on the left until they find the matching number word. 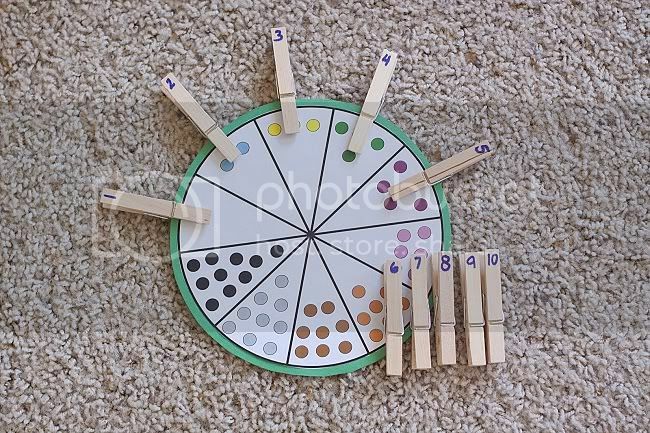 I chose to include a visual representation of the numbers (with circles) to help reinforce the concept. I also kept the number words in order to make it simple at first. 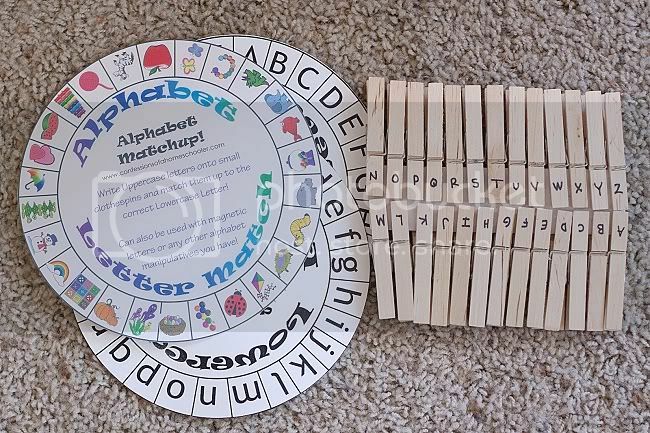 You could later on mix up the word cards and put them back in the book so it's a bit more of the challenge for the child. You could even reorder both sides if you wish. Click on the picture or click here to access the templates. Print the template for each book you are making. This will take 3 sheets of cardstock per book. Cut out the pages on the small dotted lines. Do NOT cut the bigger dotted line between the numbers/number words. It is much easier to do that later. Laminate, if you are going to. Hole punch on the x's or have the book spiral bound. Assemble your book in order and secure with book rings or spiral binding. At the point use scissors to cut apart the number/number words pages. If you want, you can reorder the number words and/or numbers but I recommend keeping the numbers on one side and the number words on the other. I searched local office supply chains and super stores to price out the book rings and found them significantly cheapest at Amazon. Thank heavens for 2 day shipping! I got it them the day of the exchange! You could definitely go with a smaller sized ring on this but I chose not to because the smaller ones were more expensive. I highly recommend laminating the books because as the pages are turned, the holes can get weak and rip out. It that happens, I recommend hole reinforcement labels. It might also be easier to turn the pages if you spiral bound the flip book, but of course that would add to the cost. I also included the little number practice book. On the first page they trace the words with their fingers. On the second page they trace with a dry erase marker. On the third page they write with the dry erase marker. And on the last page they draw lines to match the numbers to the correct number words. I laminated the pages so the marks from the markers would be easy to remove. I also included the dry erase marker and tried to find a small one that would be better for tracing and writing. Any questions I haven't addressed? Leave them in the comments! 2. Q Tip Counting Trays My friend had some trouble tracking down the water bottle ice cube trays seen in the link for a reasonable price in time for the exchange. The author of the link says she found hers at the dollar store so many you can find them there too? The variation my friend made is totally fun though so if not, don't despair! 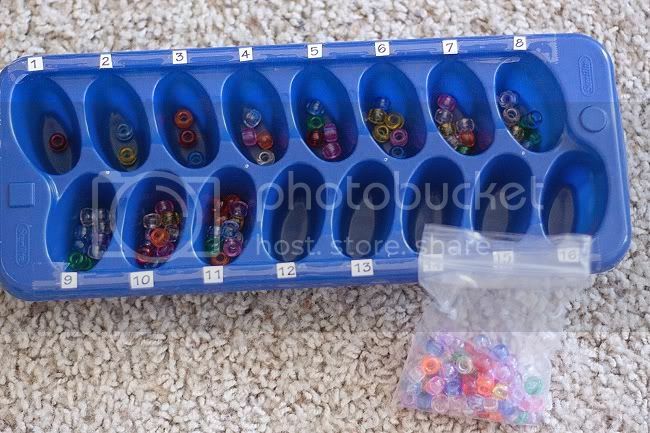 She used a regular ice cube tray labeled with numbers and included a bag of small beads. If my math is correct, you will need at least 136 beads per tray for this variation, if your ice cube tray also has 16 holes. 3. Number Wheel This link is pretty straightforward and includes the template. I think it might be good to print this on cardstock if possible. I will definitely be laminating this (along with the other paper pieces from our exchange since we didn't require lamination.) The clothespins can run expensive (especially on some of the bags below that require LOTS of pins.) I recommend shopping around. Here's a link for some on Amazon that cost .08 per pin. 4. Patterning Grids The link for this one includes the grid template. I was thinking that I might like to make this one reusable, so I plan to print the grids again on cardstock (+ a few more) and laminate them. I'm also going to start the pattern on a few of the strips so that beginners can just continue the pattern instead of creating it. I will still include some blank ones. 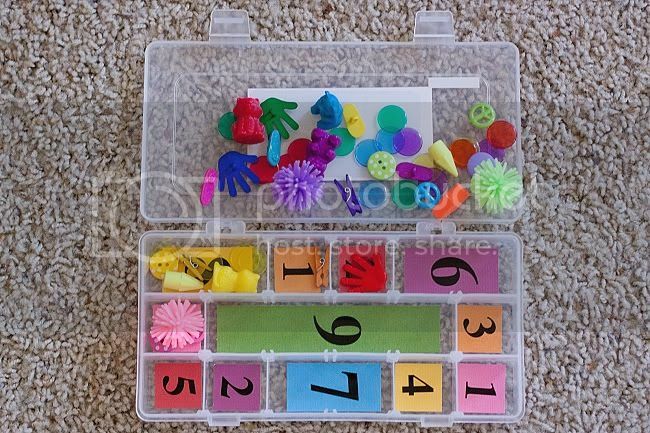 The person who made this bag said it would be easy to add more/new shapes with small scrapbooking shape punches. 5. Clothesline This one is SO cute. You'll find directions + clothes templates for the felt cutting in this link. Super helpful! As I mentioned in #3, I recommend shopping around for clothespin deals. 8. 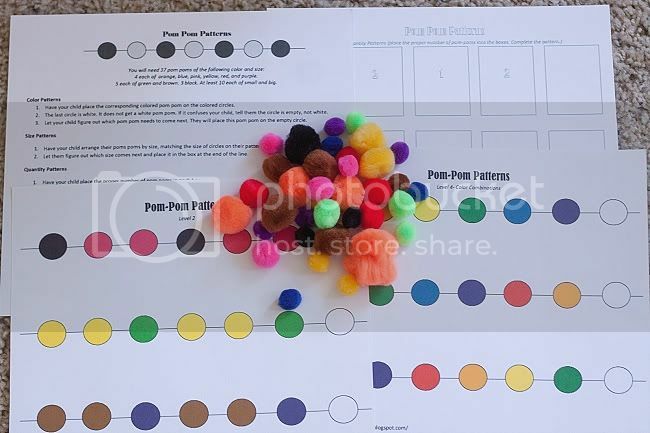 Pom Pom Patterns This activity can be a tad tedious to put together because you need to look through your pom poms and know you have a decent amount of the colors/sizes needed for the patterns on the pages. You can double side the pages to cut down on the cardstock needed. 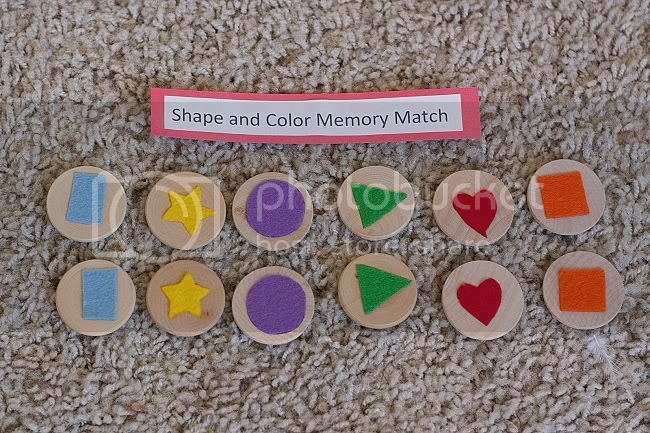 We also thought this could be a fun activity to use the magnetic pom poms from the toddler exchange, or you could make these magnetic and use the papers on a cookie sheet. 9. 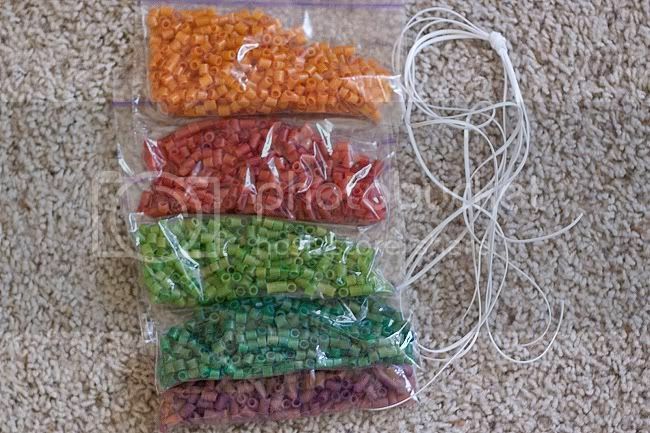 Colored Pasta Beads + Stringing I think it's great to keep the colors sorted into baggies so the kids can easily make patterns with them or mix them if they want. The link has some pasta dyeing instructions. Like I shared on the toddler exchange post, I found I had to air my pasta out at least overnight if not longer to get rid of the alcohol smell. 10. 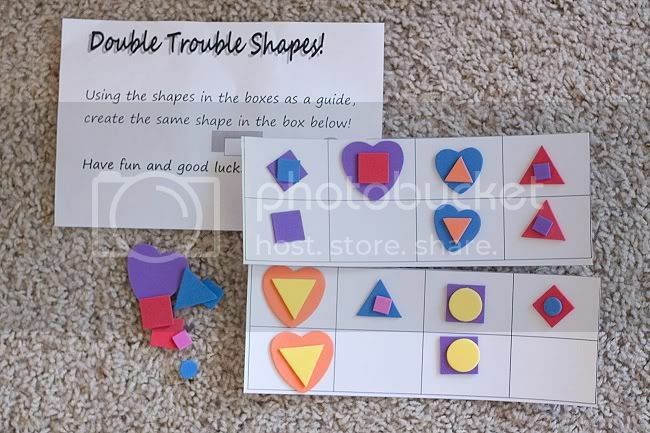 Double Trouble Shapes You should be able to find foam shapes for pretty cheap in bulk or you can always cut your own from foam sheets. 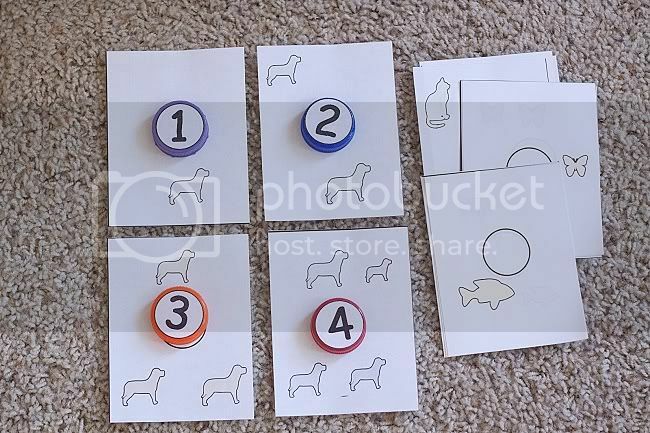 We didn't require lamination but it would be tricky to laminate these with the shapes already on them so she laminated them or covered them with contact paper or something because the front of the page is covered. So helpful! The wheels are a printable from the link. 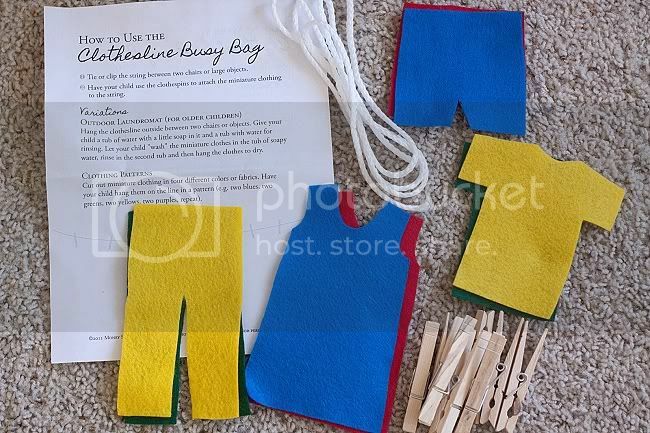 As I mentioned in #3, I recommend shopping around for clothespin deals, especially since you need 26 for this activity. 13. Hot Glue Rubbing Plates There are tips on the link for making the glue thin and even. The maker of this bag included a stack of half sheet paper and went the extra mile with two homemade crayons! Very cool. 14. Popsicle Stick Puzzles Apparently it's a bit tricky to get the sticks lined up right to attach the picture for these. The suggestion to tape them down would probably be very smart! The maker of this bag found the images she used on the internet. 15. Popsicle Color Match Another link here. 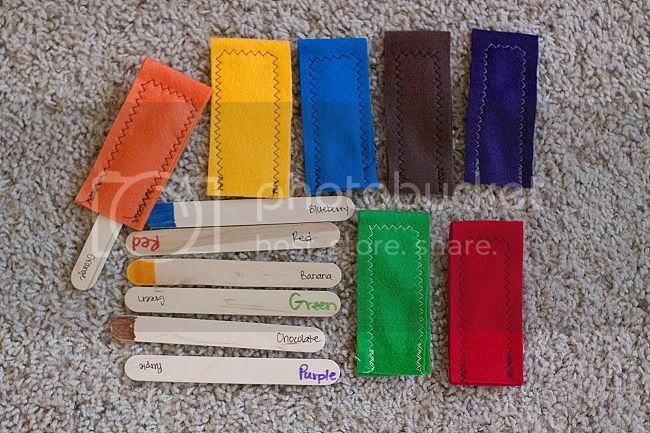 The popsicle sticks have the color labeled on both ends of one side (once written in the corresponding color for a hint) and the other side is labeled with the "flavor" and a colored swatch of the corresponding color for another hint. Nice touches to make it easier for beginners! 16. Shape and Color Memory Match I was told by the maker of this bag that getting the felt to bond to the discs took a really long time of holding the iron in it, so be warned. She also mentioned that it was tricky to cut the felt into small shapes without the felt pulling away. She used coupons to Michaels, JoAnns, etc. over a few weeks to get enough of the wooden discs for a decent price. If you need to order them online, I'd shop around etsy and other websites. Here's a link I found for some on etsy. Not sure how they compare to a craft store + coupon but worth comparing. Here are some from Amazon. And if you scroll down to the end of this post, the blogger gives a contact e-mail for someone she corresponded with who sells the wooden discs for a really reasonable price. It may be worth contacting him for a quote. 17. I Spy Bottles The maker of this bag photographed exactly what was in each one before putting them in, so smart! 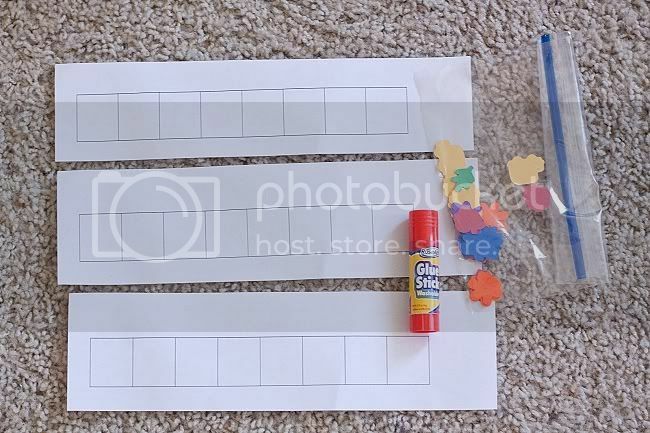 If your child isn't old enough or patient enough to look for specific things, you can take off the photo (attached to the lid with a rubber band) and just see what they can find on their own. For safety's sake, the lid was hot glued on really well. 18. 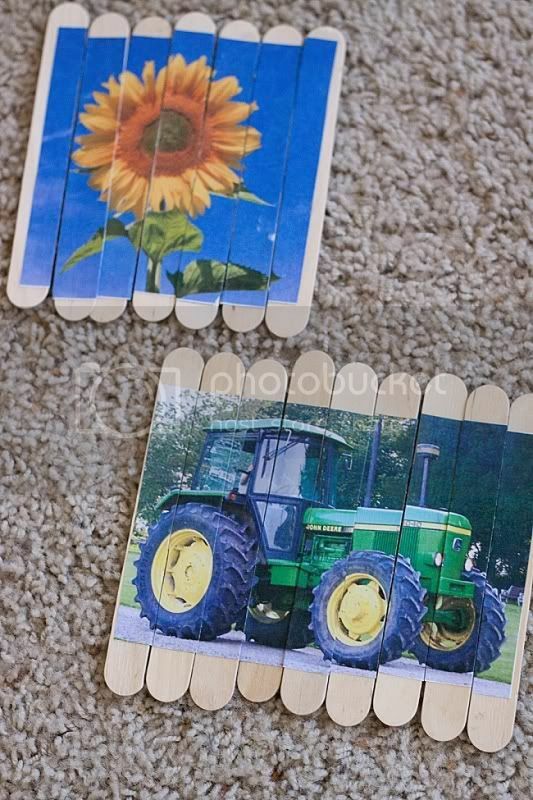 Clothespin Matching There are a couple different concepts covered here so there's lots of little strips to cut. If you're looking to cut costs, I'd look for deals on the mini clothespins. You can get 250 on Amazon for .05 per pin, including shipping. 19. 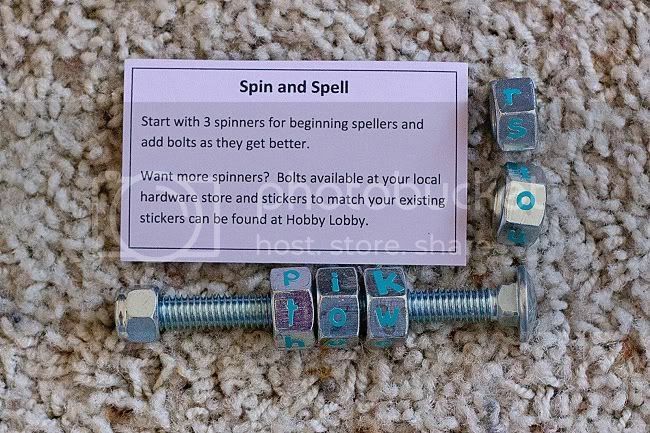 Spin & Spell This is such a fun activity. If you need to cut costs and can't find a good price for the letter stickers or rub ons, I'd very neatly write the letters on with a permanent black marker. Check the comments of the link for some ideas of what letters to use. Here was one for 3 bolts: F, L, M, N, R, S on the first hex, A, E, I, O, U on the middle one,B, D. G, P, T on the last one for 150 pronounceable combination. It wouldn't cost much at all to add more bolts to this. Our bag maker shared where she got her stickers so we could match the ones she used if we wished to. 20. Build a Cupcake Another idea here. I actually don't have photos of this because we were short at the exchange and I'm still waiting to get it from the person who ended up with an extra. But the link looks adorable! Thanks for sticking with me on this long recap of the exchange. Let me know if you have any questions! See more busy bag posts. 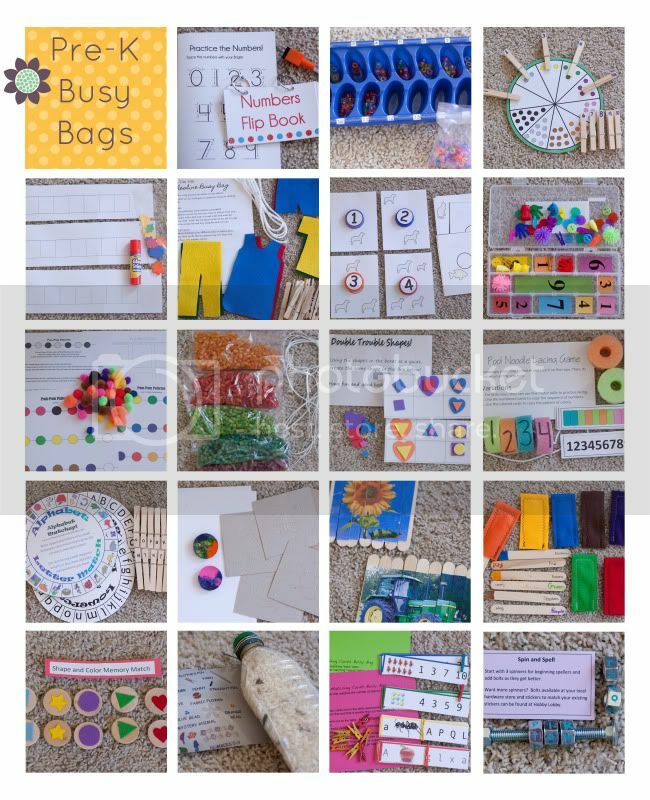 Follow my busy bag board on pinterest for more inspiration.